We’d love your help. Let us know what’s wrong with this preview of Wrecker by Dave Conifer. I absolutely did not see this one coming. What a wild ride of twists and turns and general insanity. The story line for this book is really wonderful. Fairly unique and it opens up at a nice pace, I didn't feel rushed and I didn't feel like he was dragging it out. The pacing is perfection. It falls a little left of believability. The author had me completely on his side until a final "reveal" and then he kind of lost me. I felt slightly cheated because there really was no foreshadowing there, it I absolutely did not see this one coming. What a wild ride of twists and turns and general insanity. The story line for this book is really wonderful. Fairly unique and it opens up at a nice pace, I didn't feel rushed and I didn't feel like he was dragging it out. The pacing is perfection. It falls a little left of believability. The author had me completely on his side until a final "reveal" and then he kind of lost me. I felt slightly cheated because there really was no foreshadowing there, it seemed to come out of left field. This doesn't distract from the book itself, just one thing I noticed. The writing is, as I've come accustomed to with this author, superbly done. The grammar and flow of words is fine, but the dialogue is where I think we get bogged down a bit. There's a LOT of it. I really think we could have done with some narrative as far as finding things out. While it didn't feel stilted, it just seemed overly explained at times and I kind of wanted the characters to just shut up. Overall, the story is really good - really good. The writing is fabulous and the storyline is unique enough to have kept my attention. Where this novel truly shines is the pacing - not a dull moment in the bunch. My favorite fiction genre is the thriller so this book was a perfect fit for my tastes. It has all the elements you look for in a thriller - conflict, mystery, and an intense thrilling conclusion, hence the name. The character of Jane was someone I immediately connected with and liked. Her husband Steve was irritating and unlikeable in the beginning and got worse as the story progressed, becoming a full-fledged … I’m not sure I should use the word I want here … suffice it to say I disliked him mo My favorite fiction genre is the thriller so this book was a perfect fit for my tastes. It has all the elements you look for in a thriller - conflict, mystery, and an intense thrilling conclusion, hence the name. The character of Jane was someone I immediately connected with and liked. Her husband Steve was irritating and unlikeable in the beginning and got worse as the story progressed, becoming a full-fledged … I’m not sure I should use the word I want here … suffice it to say I disliked him more and more. The character of Rob Manteo was mysterious and strange, yet along with Jane, I found myself sympathizing and liking him. The pacing and the storyline were both good with a few twists at the end that I wouldn’t have predicted, yet were consistent with everything that happened before. Although an excellent read, I do have a couple reservations. First, the ending, while satisfying in many ways, also left me feeling conflicted. Part of me says it was the right ending and another part feels setup. My other reservation isn’t about the book’s contents, but the cover. The cover is an excellent depiction of what Rob Manteo might look like. However, the message it sent me as a potential reader was to expect something in the horror genre, not a thriller. All too often readers do judge a book by its cover. I suspect Conifer might be losing potential readers who don’t make it as far as the book description. Simple enough. You need work done around the house. You bump into a guy at Home Depot who does it cheap. You hire him. Three simple things – who could imagine that they would have anything to do with a convoluted mystery that has wrapped itself around the Havelock family and begins to strangle the life out of it. But it seems like every time their new found worker Manteo does something wonderful at the house, a piece of their life unravels somewhere else. His simple manners and straightforward a Simple enough. You need work done around the house. You bump into a guy at Home Depot who does it cheap. You hire him. Three simple things – who could imagine that they would have anything to do with a convoluted mystery that has wrapped itself around the Havelock family and begins to strangle the life out of it. But it seems like every time their new found worker Manteo does something wonderful at the house, a piece of their life unravels somewhere else. His simple manners and straightforward attitude become the only things that haven’t started breaking down. Then, comes the part you won’t read in this review, the part that turns Wrecker into a thrill ride that you can’t put down. Read this book. It’s a fine piece of mystery/thriller writing that you will love and think about long after you’re done. This was a great book and it surpassed any expectations I may have had for it. It is written from the different perspectives of a few of the characters, which I thought was great. When it would switch from one person to the next I would yell, "Oh come on! I want to know what happens with this person!" Of course, I had to continue reading to get there and then would yell the same thing once the next change occurred. Overall, I thought it was a great and original story. I highly recommend this book This was a great book and it surpassed any expectations I may have had for it. It is written from the different perspectives of a few of the characters, which I thought was great. When it would switch from one person to the next I would yell, "Oh come on! I want to know what happens with this person!" Of course, I had to continue reading to get there and then would yell the same thing once the next change occurred. This is a good one to read. This was a good story. I absolutely hated the husband character, which is the only reason I gave it only 3 stars. There were twists and turns I definitely didn't expect. This turned out to be a really good book. It wasn't my usual type of genre but shortly got me hooked. Seemed drawn out, a few surprise twists, overall decent but not re-read worthy. Wrecker was a foray outside my usual reading genre, but I decided to give it a go based on the reviews and the striking cover. The writing style was fluid and the word choice economical. This made it easy to get straight into the story. The principle characters, Steve and Jane, were well sketched (Jane in particular in the early stages of the book). Their dialogue was naturalistic and revealed heaps about their personalities. Steve came across as self-absorbed and rather loathsome, which was key to some of the events that take place later on in the story. He’s also something of an unconscionable opportunist, which is why he sees no problem employing handyman Rob Manteo for a pittance after running into him in a store. Not only does he have no issue with underpaying the guy, but he leaves this total stranger, clearly a steroid abuser, alone with his wife and child. Jane is the character easiest to sympathize with. She shows some empathy for Manteo and heroic levels of self-restraint when she starts to receive unwanted information about her husband. Manteo is also easy to empathize with early on, but this changed for me towards the end of the book. The opening 60% of Wrecker was extremely well-written. Yes, there were some errors dotted around (mostly word omissions rather than actual typos), but never enough to get in the way of the story. These early scenes were subtly drawn and told from different POVs (principally Jane and Steve, but later Rockingham, a cop with rather an unhealthy interest in Manteo). What I liked most of all about the first half of the book was the mystery. Events (seemingly unrelated) begin to unfold, but there is just enough information for the reader to hypothesize. Even though I’d worked out much of the central mystery early on, it was never definite in my mind (just extremely likely). It was utterly engaging following the characters as they tried to piece together what was going on. Steve’s rapid decline was excruciating at times; it would have been more so had he been likable. In these scenes, Conifer showed a mastery of his material. I was hooked from the start and already composing a review in which I extolled his virtues as an author. This guy can write, and write well. The last 40% of the book took a slight downturn, as far as I’m concerned. It shifted from the earlier subtlety to a cliched and, at times, unbelievable pastiche of Hollywood thrillers. To a large extent, the characters remained consistent, but the action starts to become a bit over-the-top. The build towards the climactic ending was perhaps a little too drawn out and had me feeling impatient. Probably the weakest moment, for me, was when the principle antagonist explains everything that’s happened, along with motives, in what is virtually an info dump disguised as a conversation. Not only that, but the information was somewhat redundant as the reader should have already worked much of this out at that point. I felt Conifer had done a great job of leaving a trail of breadcrumbs, but then he either doubted the reader’s ability to follow it, or he doubted his own ability to have communicated the key elements of the story effectively. The editor in me wanted to bash him over the head with my Kindle and shout “Cut! Cut! Cut!”. One slip, that’s all it took, and the hard work of the first 60% was undermined. The only other gripe I have is with the abrupt ending. I guess, after all that had happened, I wanted the opportunity to unwind with the characters. That’s an indication that so much worked with this book. Character identification was one of the great strengths of Wrecker. Use of POV was excellent throughout. Whenever there is a change of POV, Conifer marks it clearly with a scene break. He builds tension very well by flipping between characters in this way, and also uses shorter POV sequences to pick up pace. In some ways, the structure of Wrecker reminded me of The Butcher’s Boy (M.R. Mathias), although Wrecker is subtler (at first) and lacks the terror of Butcher’s. Overall it was an enjoyable read that started brilliantly, but fell away a little later on. The writing is good, but there were a few too many errors (more in the second half). Nothing major, but the accumulation of missed words did start to detract towards the end. Wrecker has shown me enough to realize that Dave Conifer is an excellent writer. Anyone who can hook me early on and get me to identify with their characters has already succeeded in the primary tasks of an author. The only reason I can’t give this the five stars I thought it deserved early on is the change that occurs just past the midway point. Once the mystery is solved and the consequences start to play out, it devolves into a slightly hackneyed formula that does not fully showcase the author’s true strengths, which were on display very effectively at the beginning. I discovered this book from one of those Amazon '100 thrillers under a dollar!!' emails a while back so I figured what the hey, I'd give it a shot. I'm always looking for some new people to read so I figured it couldn't hurt. I'm glad I did because I found it to be a pretty entertaining page turner of a thriller. It also doesn't hurt that a lot of the locations are familiar to me as part of the story takes place within miles of where I actually live! Come to find out Dave Conifer lives in my nec I discovered this book from one of those Amazon '100 thrillers under a dollar!!' emails a while back so I figured what the hey, I'd give it a shot. I'm always looking for some new people to read so I figured it couldn't hurt. I'm glad I did because I found it to be a pretty entertaining page turner of a thriller. It also doesn't hurt that a lot of the locations are familiar to me as part of the story takes place within miles of where I actually live! Come to find out Dave Conifer lives in my neck of the woods and also wrote a book called Trenton Makes, after the Trenton Makes bridge which I've passed more times than I can even count...but I'm rambling..
Jane and Steve have, quite frankly, a horrible marriage. Steve more or less treats Jane like garbage and Jane takes it. He's always complaining about his job, which is a computer programmer for a drug company, he doesn't pay much attention to their 4 year old daughter. Jane feels unfulfilled and rightfully so. Throughout the book Steve is, in a word, a jerk. Actually some of the best writing comes through in the altercations between the two because when you're reading them argue you can feel the tension. It's palpable. Steve finds a handy man in Home Depot one day, a hulking mountain of a man. He's quiet, he grunts, but he comes recommended and does work very cheap so Steve hires him to do some work on the house that they've been meaning to get to. One job turns into another job and another and another. At first Jane doesn't really care for this hulking creepy guy being at their house all day long but after a while she befriends him as does their four year old daughter. It's not too long after he's been doing odd jobs at their house that Steve's job starts to crumble and their marriage, which was barely bordering on shaky to begin with, starts to disintegrate even further. All's not what it appears to be with the hulking handyman. What follows is a fast page turner that has Jane digging into this mysterious handyman's history more and more. As Jane finds seemingly solves one mystery about him another several pop up, but like a dog with a bone, she just can't rest until she gets to the bottom of it. Her seeming friendship with the handyman as well as Steve's downward spiraling career puts even more stress on their marriage and when she finally does get to the bottom of the mystery man that's been a part of their lives day in and day out for months, they end up getting way more than they bargained for and danger tries to have its way with them both. My only gripe about the book is the ending. Without being too spoilerish there was a certain situation with Steve and two other characters that I found to be totally implausible as I was reading it. It seemed a bit too much. After learning a supporting character's motivations I was willing to let that pass though for the most part. It wasn't a deal breaker though because the book does have a satisfying conclusion and all points leading up to that are rapid fire good reading. 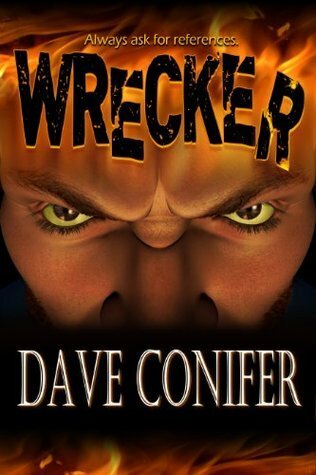 Storyline: I feel like I hide behind my puns and so I’m not going to use one with Dave Conifer’s Wrecker. It doesn’t need one. So there. (Of course, I couldn’t think of one, but that’s not the point.) What the book needs is…well…nothing. It’s pretty damned good, if I do say so myself. Jane and Steve are trapped in a bland, loveless marriage. She’s a nurse and he’s a computer programmer. Together, they have an average life, a decent home and a 4 year old daughter, Allie, and…a whole lotta nothing Storyline: I feel like I hide behind my puns and so I’m not going to use one with Dave Conifer’s Wrecker. It doesn’t need one. So there. (Of course, I couldn’t think of one, but that’s not the point.) What the book needs is…well…nothing. It’s pretty damned good, if I do say so myself. Jane and Steve are trapped in a bland, loveless marriage. She’s a nurse and he’s a computer programmer. Together, they have an average life, a decent home and a 4 year old daughter, Allie, and…a whole lotta nothing else. After lucking out and finding a contractor, the mountain sized and simple Rob Manteo, at unbelievably low prices, Steve thinks he’s found a golden goose that he can use to remodel nearly his entire house. Jane isn’t so sure that he’s as simple as he appears and she decides to find out what it is he’s hiding. Grammar/Spelling: The only issues that I noticed were some odd punctuation problems – quotation marks – that a good read through by a beta reader would fix. Character Development: All of Mr. Conifer’s characters were very well developed – some genuinely good folks and one genuinely irritating man *cough, Steve, cough, cough* – and I never felt as if I didn’t know what they were thinking or how they felt. Character rant (ye be warned): Gah… I just wanted to punch Steve in the face. Mr. Conifer perfectly paints his character as the self-absorbed schmuck that everyone knows. He has a beautiful wife, a darling daughter and a great job with wonderful coworkers and friends; he takes everything for granted and treats everyone around him as if they don’t really matter to him. I usually reserve heckling for TV and movie characters, but I couldn’t help think some rather unpleasant things about good ol’ Steve. Writing Style: The pacing was phenomenal; the mystery was revealed a piece at a time, but not at such an excruciatingly slow pace so as to leave the reader bored or too anxious about what was coming next. Granted, there were a few times when I did feel anxious, but that was because I was supposed to feel it due to the situation at the time. A delicate line to walk, Mr. Conifer, and you stayed on it straight and true. Continuity: No issues with continuity. Okay, I admitted it once before and I'll do it again. I have a thing for mysteries. It has to be my favorite genre, so whenever I see a book with a bit of a mystery in it, I have to read it. I stumbled across this book while looking for a different title. Of course, I had to find out what happened to Jane and her family. When I started reading this book, it didn't seem like it would be a mystery of any kind. Truthfully, I thought I had been duped into buying a romance. Pushing myself to keep rea Okay, I admitted it once before and I'll do it again. I have a thing for mysteries. It has to be my favorite genre, so whenever I see a book with a bit of a mystery in it, I have to read it. I stumbled across this book while looking for a different title. Of course, I had to find out what happened to Jane and her family. When I started reading this book, it didn't seem like it would be a mystery of any kind. Truthfully, I thought I had been duped into buying a romance. Pushing myself to keep reading, I finally reached a point where the road turned back toward Mysteryville and I wasn't expecting the ending. Jane and Steve were the typical modern family, complete with their own set of problems and flaws that impacted their relationship with each other. Though the story went back and forth between Jane's and Steve's point-of-views, the bulk of the story centered around Jane. It was easy to identify with her, especially with the way her husband was treating her a lot of the time. I could see why she felt intrigued about the contractor's history. Something so innocent as getting to know someone went downhill very fast for her and her family. I almost felt sorry for a few of the other characters when their histories were laid out, but my sympathy was tempered by their recent actions. I felt the book started off slowly and didn't reach a steady pace until I reach the third or four chapter. Setting the scene took time, which I began to suspect as I continued turning the pages. The more I read, the quicker the pace became. By the two-thirds mark of the book, the action had propelled the pace toward resolution with a strong grip on the reader, aka me. The resolution was a little tidy for me but I feel it was a good way to leave the story. Some of the characters were never going to be the same after what they experienced. I do wonder what will become of them. I enjoyed this book. There were some neat connections that tied the story together and made for an exciting plot. These connections result in a satisfying, if a little unrealistic, ending. The final twist is definitely unexpected, and I'm not sure how I felt about it. I found it interesting, and it just added that much more to the ending, but the way it was written made it seem a little outlandish. I think it would have gone over better had the reveal been a little more subtle. I really liked th I enjoyed this book. There were some neat connections that tied the story together and made for an exciting plot. These connections result in a satisfying, if a little unrealistic, ending. The final twist is definitely unexpected, and I'm not sure how I felt about it. I found it interesting, and it just added that much more to the ending, but the way it was written made it seem a little outlandish. I think it would have gone over better had the reveal been a little more subtle. I really liked the character of Jane. I found her believable and interesting, and the most developed character in the book. I found Steve a little more cliche. His reactions seemed more over-the-top than the story called for, and he was almost a caricature of a busy, disinterested husband. Rob's character had a lot of potential, but he confused me at times. I realize he may not have been "all there" mentally, but I never quite got the whole "I'm doing it for her" train of thought. It seemed such a big part of his motivation, but I felt that particular thread didn't have a lot of closure. From the emphasis on that, I thought it might have played a bigger role down the line. The relationship between Jane and Rob was fascinating, and it was fun to follow the path it took throughout the story. The writing was stylistically very simple, which made for a fast read. The story was engaging and interesting, with several twists and turns along the way. I found sections of dialogue to be somewhat unrealistic and trite at times, however. Some of the information presented through dialogue may have been better shown through actions, or by taking a step inside the characters' heads. Although the plot itself has a lot of depth, I felt the writing lacked some of that depth. The story dragged here and there, but it never dragged to the point where I wanted to put the book down. I was definitely interested from beginning to end. Towards the ending, the shifts between scenes and characters were quicker, and that was in line with the upcoming climax. All in all, an interesting and fun read! This novel starts with a typical overworked couple: Jane, a nurse and mom to a 4 yr old daughter named Allie and Steve, her husband, who is a computer programmer. Steve takes his family for granted. He mostly ignores his daughter and decides, on his own, that there will be no more children. For Steve, things start going wrong at work when he is up for a promotion. Steve blames everyone but himself and eventually starts taking his frustrations out on his wife. Then he loses his job completely. But This novel starts with a typical overworked couple: Jane, a nurse and mom to a 4 yr old daughter named Allie and Steve, her husband, who is a computer programmer. Steve takes his family for granted. He mostly ignores his daughter and decides, on his own, that there will be no more children. For Steve, things start going wrong at work when he is up for a promotion. Steve blames everyone but himself and eventually starts taking his frustrations out on his wife. Then he loses his job completely. But before all this happens he decides to get some of the many things needing to be done at home worked on. He is introduced to Rob Manteo, a man who can do anything for a reasonable price. Jane, however, is uncomfortable around Rob and fears for Allie's safety. But he is very kind to Allie and pays attention to her. Jane begins to suspect that Rob gets his huge muscles with the aid of steroids. His frequent headaches, vomiting and shakes seem to validate her suspicions. But nothing is as it seems. Rob Manteo is someone else and he has an agenda other than helping with the home repairs. I'm not sure how to feel about this book. It read like a lifetime movie. The beginning was a little slow, and I figured out some major plot points wayyyy before the main character was getting there. I spent a long time wondering why Jane couldn't get it together. I also have trouble because I liked the bad guy for the majority of the book. I didn't want him to be the bad guy. Also, the husband was an awful person and then suddenly at the end was all lovey and stuff. I didn't get that part. But, in the positives, I could hardly put the book down. I was engrossed in the plot and wanted to know what happened next. I plowed through this book not expecting much. Honestly, this story telegraphs it's punches so far ahead that you really only need to read the first couple of chapters to figure out how it will develop. After I finished, I realized that I didn't like any of the characters very much. Jane is remarkably passive about a lot of jerky husband's behavior, which makes me wonder why she's so pro-active in other ways. Anyways, the conclusion would've been fine except for a weird extra twist thrown in. Which I plowed through this book not expecting much. Honestly, this story telegraphs it's punches so far ahead that you really only need to read the first couple of chapters to figure out how it will develop. Anyways, the conclusion would've been fine except for a weird extra twist thrown in. Which made me throw up my hands in disbelief. This is one of those books you want to read in one sitting because you know something good is right around the corner. I, unfortunately, wasn't able to do that. I read half during my read-a-thon but I had to fit in the second half where I could. I was even tempted to read at red lights (I managed to resist though) because the action had started and it was so hard to put down! Overall, it wasn't quite as much of a thriller as I expected but the story was interesting and unique enough that it didn This is one of those books you want to read in one sitting because you know something good is right around the corner. I, unfortunately, wasn't able to do that. I read half during my read-a-thon but I had to fit in the second half where I could. I was even tempted to read at red lights (I managed to resist though) because the action had started and it was so hard to put down! Found this book to be interesting as far as holding my attention. The plot was a bit murky at times, and some of the characters stretched a bit for credibility. I would however recommend it as a quick, enjoyable read. The end began to drag a bit for me, but even that was forgiveable. I do like the non-fairytale ending of the book, a welcome change of pace. All in all, I don't regret purchasing it or reading it. a "Thriller" with no thrill. no suspense very easy to figure out every time he introduces a new "twist" it is so obvious of what will happen. The language was atrociousness! I always heard that fowl language made a person sound stupid and I say after reading this book David conifer must be the biggest idiot around! Was not worth the price I paid $0.00 I had it removed from my kindle. This review has been hidden because it contains spoilers. To view it, click here. Wrecker will make you want to run a background check on everyone who comes into your life. This was a great story. I liked how Conifer sets it up in the beginning with it all being about Jane and Steve. You think Steve is going to be the evil guy here and Jane will be his victim. Nope, not the case. Nice twist with Manteo and Creedmoor. Wrecker is easy, page-turning read. This book will keep you on edge. I have never read such a long book in such a short period of time. while on the he edge of my seat I could not stop turning the pages. The twists and turns in this book are fascinating. It will definitely make you think twice about doing wrong to others. You just never know how bad it will effect them or what they may try to do to you in return. It was great! When I first read it I thought something totally different was going to happen at the end. I was so blown away. I usually read horror but this was just a mind play! I love the characters I really got into Jane! This was pretty good for a free book. For once I found myself kind of rooting for the bad guy a little bit. He was a very sympathetic character. Jane was a great heroine. Steve was a horrible person, nothing about him was likable. I suppose that was why I wanted Creedmoor to finish him off! Not logical at all. Not my cup of tea. Started out great. Seemed that the writing devolved as the story went on. The ending was completely implausible and totally disappointing.